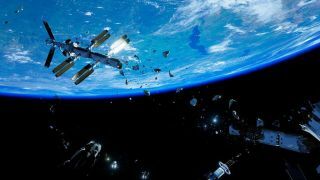 Adr1ft, the "first-person experience" about dying horribly in the cold void of space, looks gorgeous, in the same sort of way that SOMA looks like it'll be a lot of fun: The graphics are incredibly lifelike and the view is unbeatable, and that jagged piece of debris that's coming at you like a bullet is going to tear a hole in your suit unless you do something about it in the next roughly two seconds. It will run on a standard PC but is obviously best experienced with a VR rig strapped to your face, and to emphasize that fact, publisher 505 Games announced today that Adr1ft will come out in early 2016 as an Oculus Rift launch title. "Virtual reality is the next phase of innovation in gaming," 505 Games President Ian Howe said. "As a publisher, we’re always looking for the best platforms and technology to showcase our games and working with Oculus will allow gamers to experience Adr1ft in an enhanced way that only can be done through the immersion of virtual reality." Adr1ft was originally supposed to be out this month, and in fact the Adr1ft website still lists a September launch date for Steam and consoles. This technically counts as a delay, then, but that's okay by me. Honestly, given the nature of the game, I think I'd rather wait and catch it on VR even if it did make it out before the end of the month. Unfortunately, that means we're stuck with a slightly-less-precise launch window of Q1 2016 until the Oculus guys decide to announce a date for their new toy.